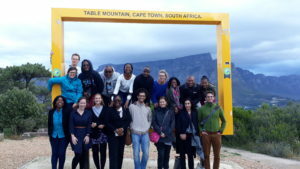 Last week the FRACTAL Research Consortia met in Cape Town to take stock of their progress to date and plan for the year ahead. FRACTAL is working with nine cities – Windhoek, Lusaka, Maputo, Blantyre, Harare, Gaborone, Durban, Cape Town and Johannesburg – to connect policy makers and climate scientists through Learning Labs that help the city make climate resilient decisions. This learning and sharing is reinforced through embedded researchers within each city. So far, key achievements of the programme have been to raise the profile of climate change within city decision-making structures, particularly beyond environment departments and across a range of sectors. This is driving political leadership to integrate or mainstream climate change concerns within city planning and budgeting processes. Water has emerged as a central theme with many of the cities identifying it as the key vulnerable sector. The threat of multi-year droughts resonated with many of the cities in the region. This was highlighted in a role-playing session on day two in which climate scientists and city officials “auctioned” off their services to the crowd. The top bid was placed for a multi-year drought study by a multi-city consortium. Opportunities for Public Private Partnerships emerged as a key learning in the city exchanges. Highlights were shared on Windhoek’s public/private water management arrangements and an Innovation Fund project in Blantyre that is looking at the potential to bring in the private sector in a solid waste to energy scheme. A mess mapping exercise helped the audience unpack the influencing factors (non-climate) affecting decision contexts with each city. This enabled the participants to dig deeper into the context of individual decision to see where within the decision space climate information can make a difference. A number of cities also highlighted interest in a training session for city officials both on climate change basics (e.g. what is resilience?) but also governance and leadership on climate change issues. The last exercise of day two introduced the participants to a capacity evaluation tool that can help cities determine where there might be gaps in their institutional capacity and how these might be strengthened. The rest of the week focused on next steps as individuals, as cities and within the research themes. A busy and productive week for the FRACTAL team that will shape the course of their work over the next two years.